A while ago I received the most wonderful box of Korean beauty products from my high school and university friend, Nicole. I asked her to send me some postcards and she sent me a box filled with beauty products instead. How amazing is she?! I was so surprised because she didn't say a word to me about it. Never in my whole life did I ever think I would have the privilege of trying out Korean beauty products. I know many people who have worked and travelled there after university. From what I have heard Korean women are big on beauty, love looking stylish and their shops are filled with amazing fashion and girly products that are sold for cheap. Uhmm... can someone please buy me a ticket to Korea?! I think I would fit in just great there! In my box I received postcards, Innisfree face, nail and body products, Nature Republic makeup, body wash, face masks and nail art. I have been using all the goodies this past month and I can't wait to do reviews for you! All these products are only available in Korea. Boo HOO!! :-( I have found some Innisfree and Nature Republic products on Ebay and Wantitall.co.za. All I can say is you will be paying 50% more online than if you went to Korea and bought it there yourself. Find a buddy or pen pal in Korea and get them to send you samples. As you can see in the picture on the right, I received an Innisfree baby pink nail polish and Innisfrree Eco Quick Dry nail spray. The nail polish consistency is quite thick so one coat is enough to give great colour to your nails. The quick dry spray is a nifty little 30ml bottle that turns wet nails into glossy dry nails in seconds. This product is amazing and works great for when you on the go.I added the nail art stickers she sent me for a playful look. I will be doing an in depth review on the two beauty Korean brands so look out for that. I found a wonderful blog about a South African living in Korea by Candice Goddard, visit it here. Your goodies all look amazing. So sweet of your friend to send them! I was actually reading Candice's blog a few days ago. We studied together at uni as well. Wow, what a small world. I love reading her blog. it is really refreshing to read something different. My brothers dream girl would be Korean haha they are always gorgeous , you seem to have gotten so many amazing goodies , luck lady! The box is so cute. Gorgeous nail! Loooovvveee the look. Playful yet girly. Thank you Lynette! It was really fun to play around with it. 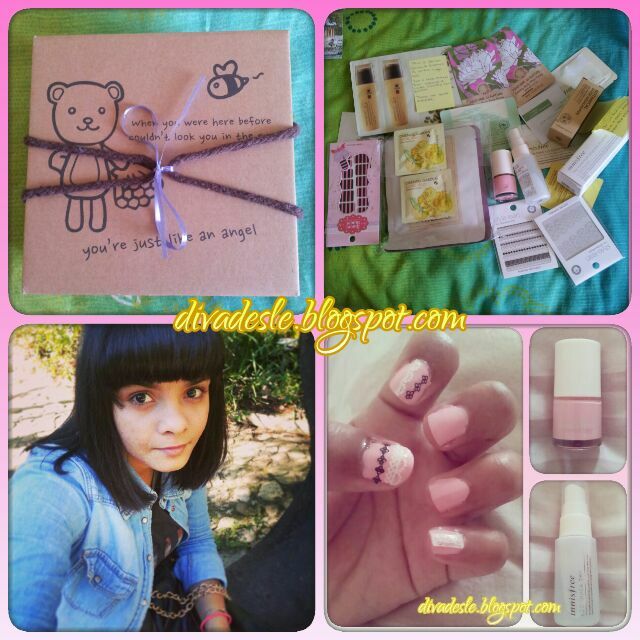 Aw you're so lucky to receive all the fab goodies from across the ocean, awesome friend indeed! I have also heard good things about Korean beauty products and thankfully we have you to tell us more! the nails came out beautifully! That was so sweet of her! I love discovering beauty products from different countries and heard in Korea they are also super cheap too bad we have to pay import tax. Did you try finding any on strawberrynet.com?